Mixing finishes is a great way to add a modern edge to your home. Because it's such an effective look in any interior, we thought we'd make this design feature readily available to you, in the form of the Cross 4 Seater White Gloss and Oak Dining Table. White gloss goes really well with a range of colours and finishes, bringing a real sense of crisp, clean elegance. The oak veneer is a great mix, bringing a bit of warmth and texture to perfectly counterbalance the table tops smooth white surface. 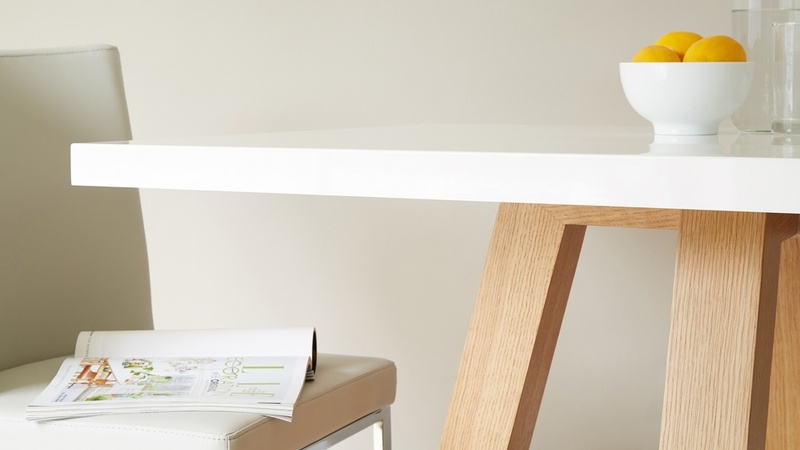 The rectangular table top of this Cross table is a smooth white gloss. The application of this super modern finish is a multistage process involving 3 coats of gloss, each dried for 24 hours.The table is then polished by hand. It's this extensive application process that really perfects and secures the finishes colour, depth and durability. The legs of this Cross table are slim enough so they don't look chunky, but thick enough that they have an impactful visual strength. We've used the thickest possible wood veneer, applied and finished by hand. This means you get the stylish look of solid oak without the concern of splitting that you can get with solid timber. 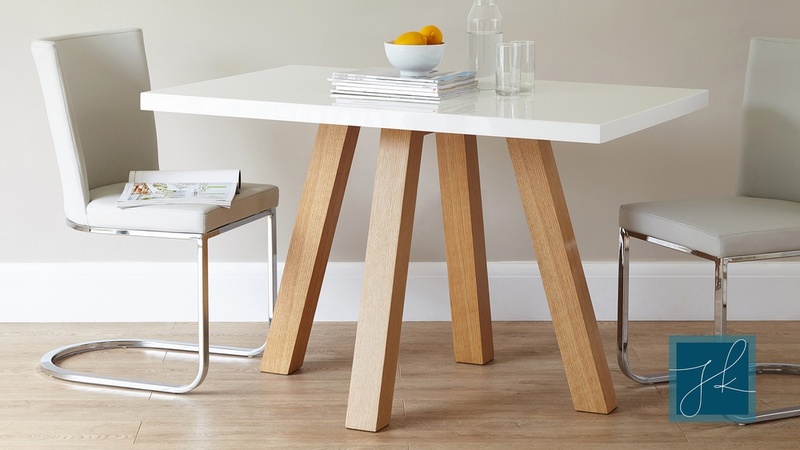 Instead of the legs just poking out from the table, the oak veneer leg frame crosses under the white gloss tabletop. We did this because we wanted to keep the design of the table very simple, but in a sleek and stylised way. By adding the under frame, we've created an extra bit of design with lots of added stability. The ingenuity of the frame means this table also hosts some of the great qualities of a pedestal base; you can sit guests two by two or one on each edge very comfortably without the table legs getting in the way. This makes the table very versatile and great for friend and family gatherings. The mix of finishes on this Cross table have been carefully selected with the intention of bringing a welcoming warmth alongside great design to your dining area. The white gloss and oak finishes are so easy to match with existing interiors, making this table look right at home in your dining area! We use a high grade of MDF for this range of tables. This is part of our brand commitment to always providing products that are as safe as they are beautiful. You can buy our products with absolute confidence and peace of mind, knowing you are putting the safest materials around your family. The Cross 4 Seater White Gloss and Oak Dining Table is a great social hub, both for social gatherings and family meal times. Like the style of this table? Then take a look at our Cross 4 Seater Grey Gloss and Oak Dining Dining Table or our Cross 4 Seater Oak Dining Table, both in the same design but with a different selection of finishes. These products are all part of our Exclusively Danetti with Julia Kendell range. Why Not Play with Placement? Flexibility and versatility were key criteria for Julia when we started working together on this range. We worked on quite a few prototypes of this table before we got the leg placement just right. The result is that the table works just as well set up with one chair on each side as it does with two along each side. If you choose to go for one chair on each side why not make the most of the space and choose four dining armchairs. The Form Dining Armchair has been designed for exactly this scenario; they are just a little bit wider but really do give that generous huggy feeling, making you want to sit back and relax. If you choose this option all you need to do is individually add the table and chairs to your basket, building the set as you go.